A bit of press coverage for research into unrealised tunnels under Manchester that have been proposed to try to 'solve' the city's transport problems. Many schemes have come and gone down the years but none have been built. 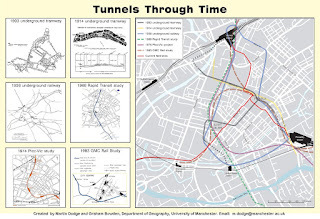 The 'tunnels through time' schematic was created to try to summarise some of the more important proposals and the different routing possibilities for serving the existing train stations and connecting across the city centre. 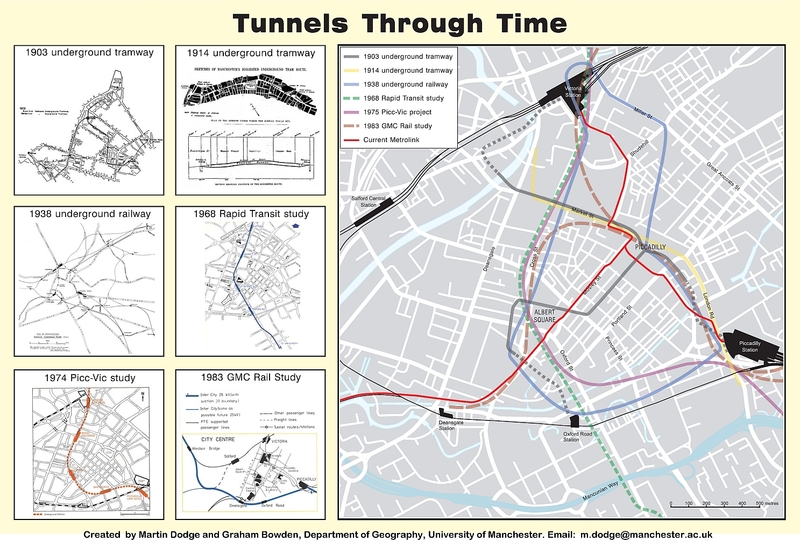 Following a well crafted press release by Deborah Linton, the Manchester Evening News ran the story on 11 August: Revealed: 100 years of failed transport plans for Manchester – monorail and underground tube included. More background detail is given in the chapter on the 1970s Picc-Vic rail tunnel in our Infra_MANC exhibition catalogue.